A quick post because I have to get back to grading algrebra exams... ugh! But I have another Make it Monday entry for this week! Second, I also stamped the Mat Stack 4 shape on my card, with a light orange chalk ink, using a foam "stamp" that I cut with the die. Then I stamped the image from Mat Stack 4 Collection in a darker orange right on top. Then I stamped the cake image from Birthday Tags in a light aqua, and the sentiment from Fillable Frames #1 in a darker aqua. Inked up edges, used Impression Plates on the white (canvas) and the Aqua Mist card base (polka dot), added ribbon and a button with twine. You people are not going to be happy until i go and buy some fun foam :) Again love the colors you are using!!! Your new banner is too cute too!!! This is really cute. love your color combo. Debbie this is so CUTE!!! LOVE your color combo! Very nice, Debbie! I especially like how your stamp of the mat stack frame gives a perfect border to the second stamping! Great idea! Congrats on the shout out from Nichole! You card is excellent! I love how you used the foam to make a frame. Cute card! Love the tips! I especially like how you die-cut the mat from fun foam and stamped it to make a mat for the Mat Stack. This can be done for any of the dies. Thanks for sharing these ideas and congrats on the shout out! Such a bright and cheery card! Thanks for sharing! great card! 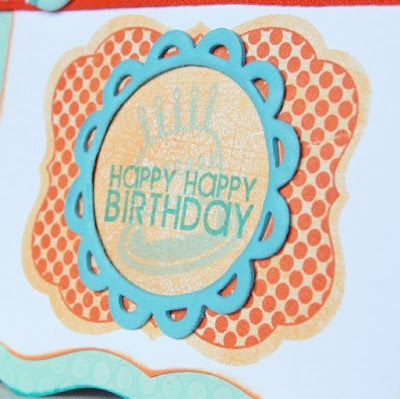 i love those colors (are you using it for Heather's Totally Hues challenge?). and great tip about adhering the tape FIRST before cutting. i didn't even think about that and could have used the tip.